Building and scaling technical tools and workflows at a rapidly growing startup requires many tradeoffs. Do we work independently, or standardize coding practices with a shared style guide? How do we pivot from quick prototyping to analyses for publications? The challenges faced when scaling the team from two to five are very different than when scaling to 30 or more across multiple teams. 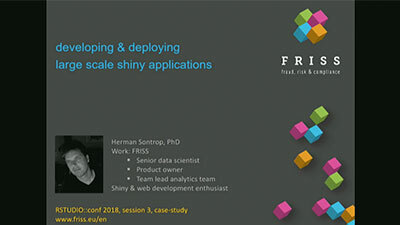 In this talk, Sandy Griffith, senior methodologist at Flatiron Health, will discuss the challenges, opportunities and learnings of building a culture of R in a tech company comprised of people with a diverse set of backgrounds and skillsets. She will use examples from her experience as an R user at Flatiron Health, a healthcare technology company working to improve treatment options and accelerate cancer research. As of January 2015, I have joined Flatiron Health in NYC as a biostatistician. Most recently, I was Assistant Professor of Medicine in the Department of Quantitative Health Sciences at the Cleveland Clinic. In 2012, I completed my Ph.D. in biostatistics at the University of Pennsylvania, working with Dan Heitjan. My dissertation focused on methods for heaped self-reported data with application to cigarette smoking. I am currently working with oncology-related electronic medical record (EMR) data, with particular interest in issues of data quality and completeness. Other areas of research include patient-reported outcome measures, neurology, and behavioral health. I get excited about interesting datasets, R, visualization, and reproducible research.